A song Florence Welch wrote while battling homesickness on tour has been picked up as the theme for Tim Burton's magical new film. 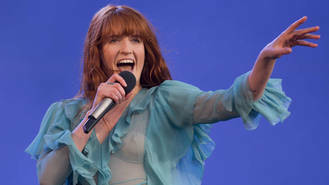 The Florence + the Machine singer tells WENN Wish That You Were Here was a tune she wrote detailing her feelings about her friends and loved ones, who she hadn't seen for months. And when director Burton and his team approached her and asked if she could contribute a song to the soundtrack of his new film, Miss Peregrine's Home for Peculiar Children, she felt the track she wrote in the back of a tour bus would be perfect. Welch says, "Wish That You Were Here is a song about the idea that love is a journey and a risk. "Having been on tour, I've lived in a sort of magical time bubble, where the days almost blend together. It's amazing, but it comes at a cost - a cost of leaving the people you love behind for a year or two. You kind of feel like if you could sing a song into the wind and maybe the wind could take it to them in a way that you can't with a text or a call. "You just want to send your love in a different way, in a way to somehow reach the unreachable." Wish That You Were Here will play over the end credits of the film, which hits cinemas around the world at the end of September (16). Welch reveals she worked closely with filmmaker Burton to perfect her song for his adaptation of Ransom Riggs' best-selling 2011 novel of the same name. "I've always been a huge fan of Tim Burton's," she adds. "We have a very similar sensibility... I knew we would get along really well working together and we did. I feel like we're coming from a similar place of quite frantic imaginations trying to get the words out before the pictures in our heads disappear. He feels like a kindred spirit. "I actually sent him a note about six years ago. I was in Australia on tour there for the first time and visited an exhibition of all his work. I wanted to leave him a message and all I had on me was an X-ray of my hand, as I had just broken my finger. So I wrote on the X-ray and gave it to the gallery to pass on and never knew if he got it. When we met for the first time, he told me it's been hanging up in his office ever since."